With a playing time of almost one hour Illumion spreads out the music and takes its time to present a very special musical approach. Prog and Chinese music in symbiosis is hardly anything we have heard of before. The exception here would be Fairyland from Shanghai and some of Wu Fei's music. It is natural to ask; will this really work? To make it work the band's leader Eveline van Kampen has a very good education and has brought in skilled and experienced musicians. From the great prog ensemble Songs of the Exile come Peter H. Boer and Emile Bollard, while vocalist Esther Ladiges, among other things, has sung with Ayreon, Ixion, Sangamo and Unicorn. The cover was designed by Thu Phuong Nguen and is utterly appealing and the lyrics are of the same caliber. The inspiration comes from travelling in Hungary and China as well as diving in the North Sea! In addition, books by Franz Kafka, Charles Dickens, William Blake, Edgar Allan Poe and Oscar Wilde have been a source of inspiration. The aforementioned mix with Chinese instruments is not taken out of the air in any way trying to be original. It stems from Eveline van Kampen actually studying in China for a year and therefore was influenced by Chinese traditional music and instruments. 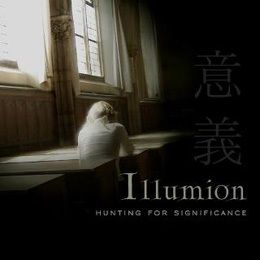 The music on "Hunting for Significance" is sometimes up to Ayreon's universe, but not so pompous. It is atmospheric and varied with great emotion and on the whole it is quite symphonic with roots in the more rhythm oriented prog. The exotic elements of Chinese ehru and pipa create a special feeling and are well incorporated into the music. The many females give the special Illumion sound and separate them from most debut albums. It is an indisputable feminine "spirit" in this album which is very appealing and Esther Ladiges playing the Irish flute is somewhat unusual but great musically. This record grows for every time you play it and that is usually a very good sign. The talented guest musicians contribute to the big variations in moods of this record. "Hunting for Significance" is a very fine debut that stands out from the musical masses in most ways with all its delicious details. In that perspective we can say that the 'quest for meaning' - as the title indicates is a success! We look forward to several significant albums from these musicians from the clog country.